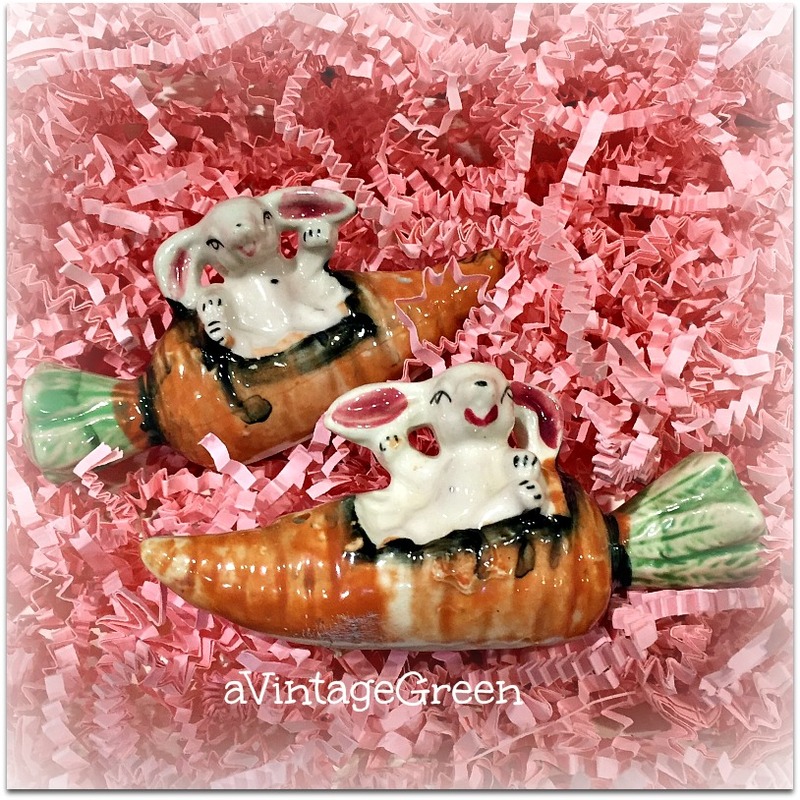 Two cheeky Rabbits in Carrot Canoes, salt and pepper, visiting from the 1940's. 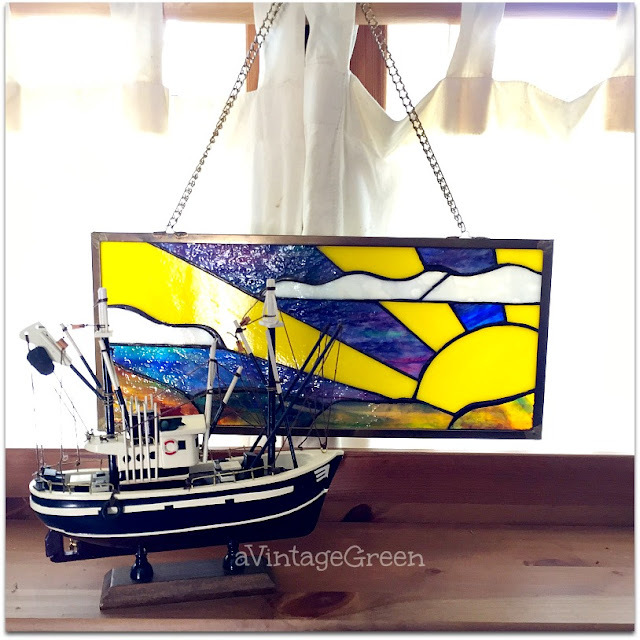 Love seeing sun shining through a stained glass wall hanging. 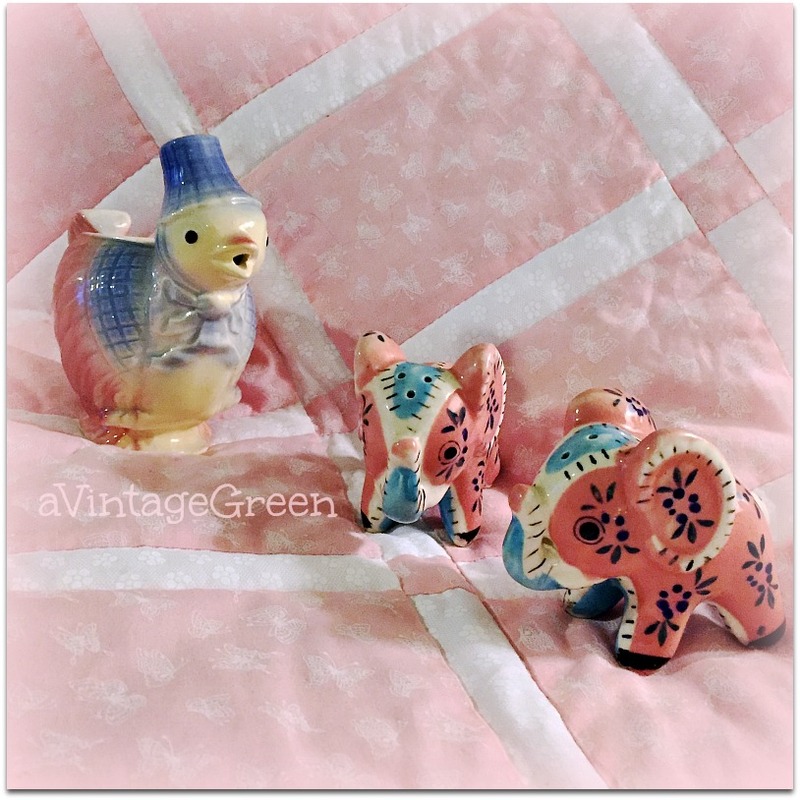 My favourite local Church sale had a pink and white baby quilt, a pink, blue and white elephant salt and pepper and a creamer chick with blue bonnet and cape. The lovely ladies were well organized before the sale began, had lots of people to help, priced, wrapped and bagged (and held until I was finished shopping). Thanks to you all. Estate sales that are well organized, with lots of helpers, make it easier both for the buyer and the seller. If the estate sale has a bit of hoarder feel, even better. Only a few kitchen type finds of the rustic sort but a great many 'finer' decorative glass and china pieces were available. Another church sale to raise funds toward building a school in India had a well organized and 'grouped by type' event. Good range of finds. The many ladies and gentlemen were great at 'holding' my bags while I continued to shop plus the Youth Group were helping - and my bags and finds were carried to my car ! 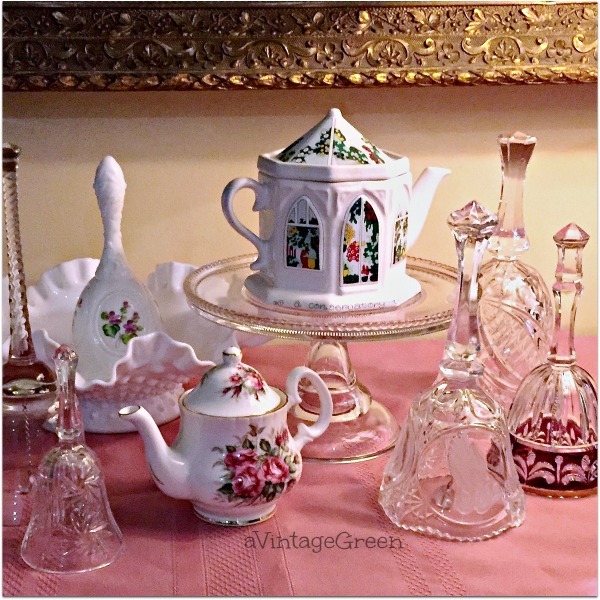 The first Estate sale had a few bells and teapots so I grouped them around a cake stand with a Fenton ruffled rim candle holder bowl holding a small Fenton basket. I have posted about the tools I found at the first Estate sale but I forgot to add that my Dad was a carpenter and all of us (sibs) like to fix, build, make things work better just like Dad - we worked as his helpers from a very young age whenever we could. The sib Boys are Journeyman Carpenters and the sib Girls are not too shabby at repairing, fixing, constructing, re-building etc. either. The collection below has tied twigs, a cabbage slicer from Sweden, a box of vintage Dominoes and a crib board, then 3 sets of cast metal painted salt and peppers and finally a treasured hand made table cloth, some mid-century pink bird salt and peppers, two Royal Grafton mugs and a dragon fly hook. I collect tools - rusty, still useful and I clean them. Mostly I wipe them down with Hemp Oil (Fusion and MMS). I use Hemp Oil on wood and metal and leather to bring back some of the original look. Found an Art Pottery Hager Pitcher with Burnt Orange floral decoration and a pretty bell at the thrift store. 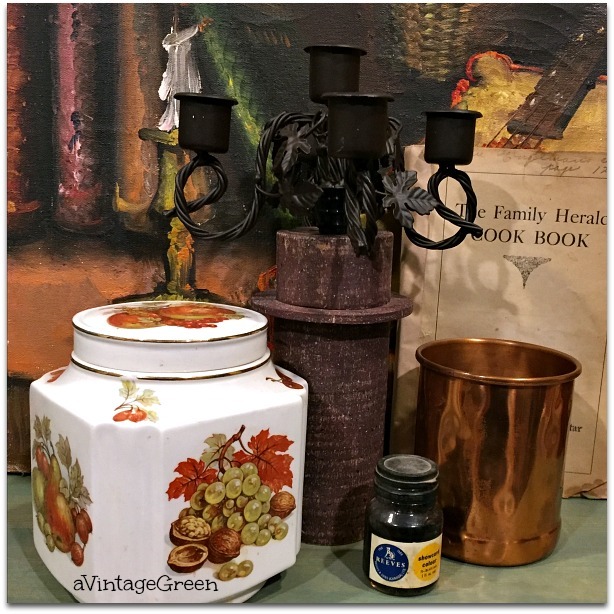 More thrifted finds, a Mid-Century Sadler Tea Caddy, a copper beaker, The Family Herald cookbook, an ink bottle and a black candle 5 light candle holder. 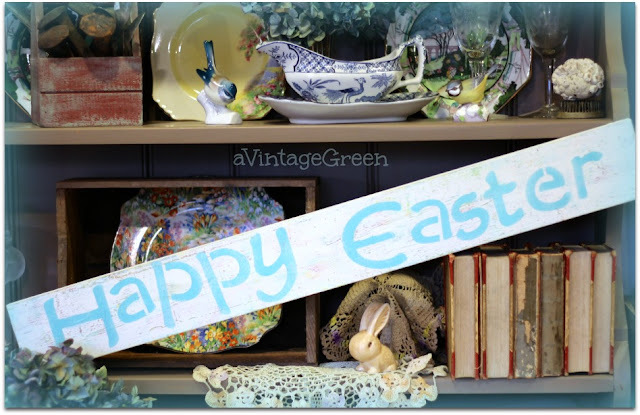 Thrifting, finding, re-purposing, repairing, sharing, photographing and blogging was my 'after I retire' choice of work (which I began 13 years before actually retiring - except blogging which I started in 2009, (2 years after retiring). 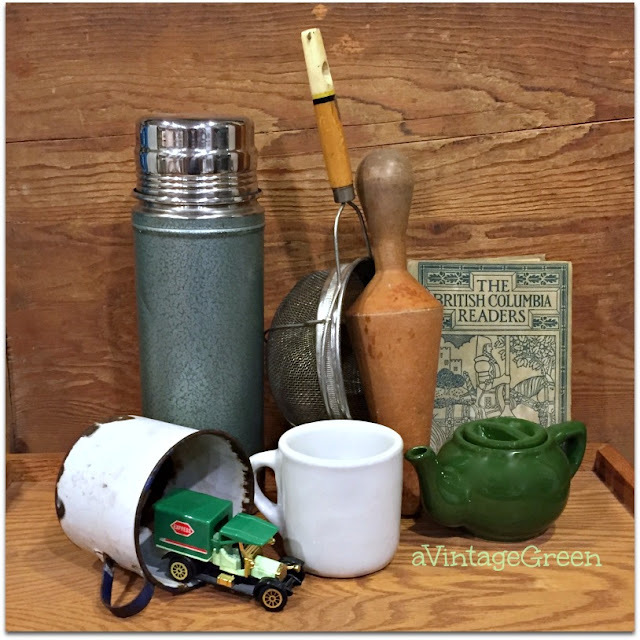 I love learning about new old pieces, researching, cleaning, repairing and sharing through blogging and through my booths at Village Antiques Mall in Fort Langley BC. I love the blogging community of 'blogging friends' I have found through blogging - people who share their lives, what makes them tick, who create, find, fix, share and enjoy, have adventures. I learn from them and share back. Some great finds. Church sales are usually a good place to find great stuff! Really nice finds, Joy! You have such talent at display, a lot of decorators should envy you. Your share of the two cutest bunnies and carrots that I can imagine brought me smiles. These are some great finds! We could love to have you link up at Thursday Favorite Things too! The party is every Thursday at 9:00 a.m. EST through Saturday at 9:00 p.m. Hope to see you there! I love all of your finds. I find some great stuff at church rummage sales and occasionally at estate sales. Your items are all very unique to what I usually find. Thrifting, cleaning, researching, selling is my "job" till forever too. What else is more fun?! Joy you do find the best things! I think I recognise a couple of this weeks items. The cottage teapot I think is one of four which represent the Seasons, (I had all four about 25 years ago!) 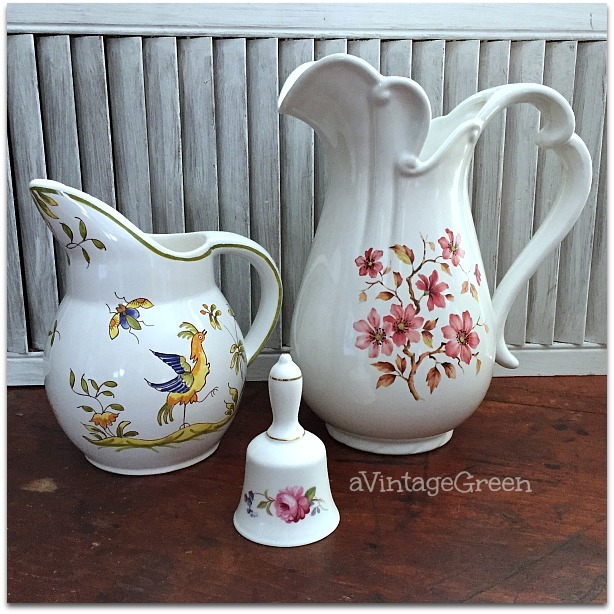 and the decoration on the pitcher next to the Hager pitcher looks French to me, a possible Moustiers copy? Thanks for sharing your treasure trove with the MM crowd this week. There are some sweet things to be found at estate and church sales. The cottage teapot is lovely. Great finds Joy. I especially love the chick creamer! Thanks for sharing with SYC. I really enjoy browsing through your posts ....for me it is a great learning experience because I am not at all crafty or handy or talented (though Bill is and I have helped with lots of projects over the years ...). I agree with what you say about blogging. Great finds! Thank you for sharing at Snickerdoodle. Great finds. Thanks for adding my party to your list and thanks for sharing at Keep In Touch. This is quite a collection. Thank you for sharing with Blogging Grandmothers. #BloggingGrandmotherLinkParty. I would love to visit your booth and browse through your treasures! 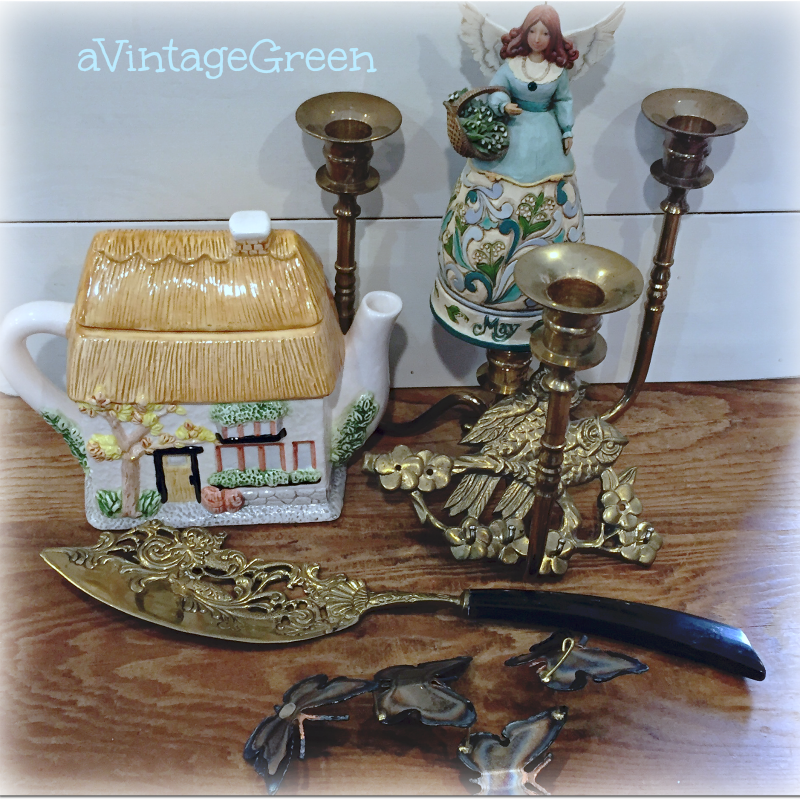 Thank you so much for sharing your new finds with us at Party in Your PJ's. Hi Joy, I just wanted to let you know that I have featured you on this week's Party in Your PJ's! Stop by! 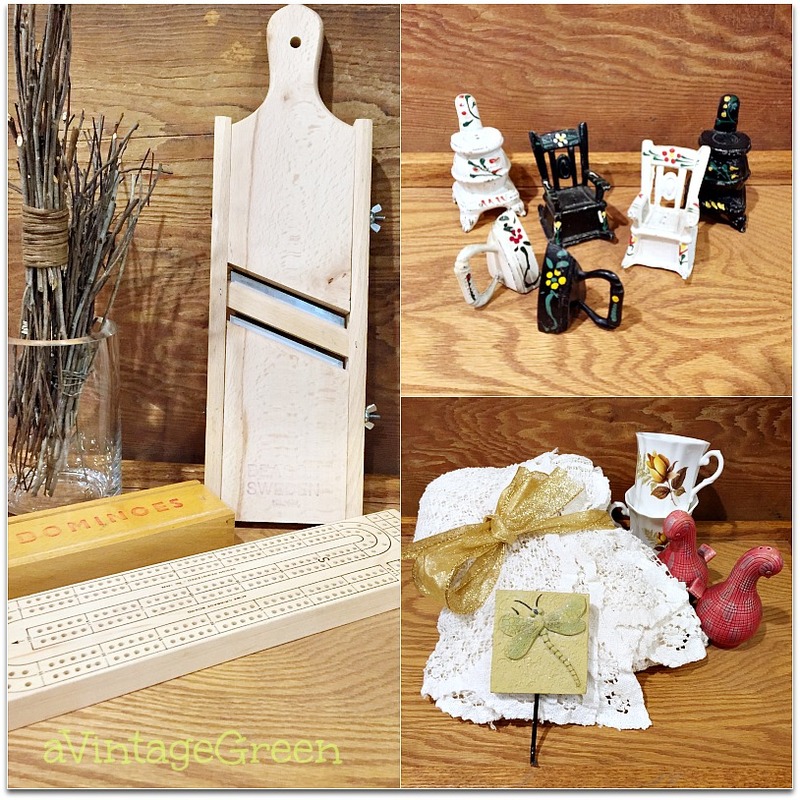 Thank you for sharing your wonderful finds and creations with us on the #BloggingGrandmothersLinkParty!